Home / Articles by Njkinny / #SpreadTheVibe: A 'Tweet' Connection between Ministers and Common Man! #SpreadTheVibe: A 'Tweet' Connection between Ministers and Common Man! 2015 saw many inspiring changes in the world around us but today I am going to share the good feeling we all got when the Ministers who all had seemed so unapproachable for so long became directly connected with the public through social media platforms like Twitter. 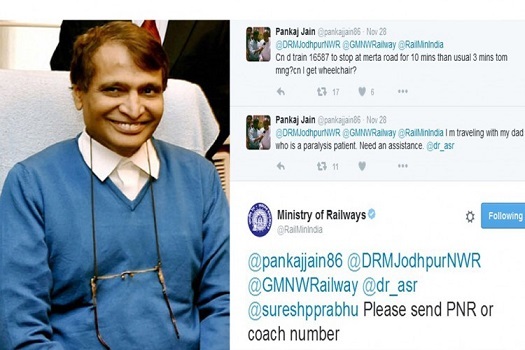 2015 saw the Railway Minister, Suresh Prabhu providing instant assistance to people in real time. With just a tweet, passengers saw the Railway Minister not only hearing their grievances but also taking instant action! Right from providing milk to a small child to providing assistance to a woman passenger who was being harassed by a male passenger, Suresh Prabhu proved that every complain by the Common Man was going to be heard no matter how busy he was! 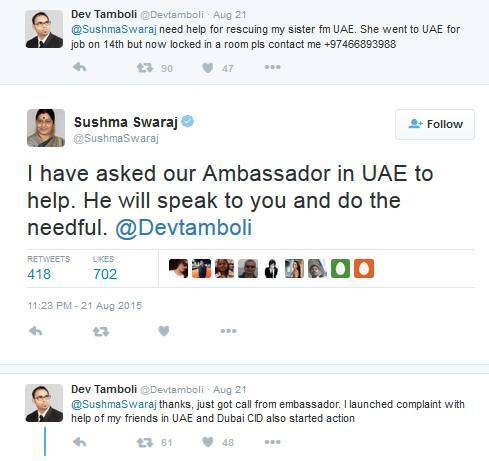 The same action was seen being done by Sushma Swaraj who is the current External Affairs Minister of India. She is also very proactive on Twitter and was seen hearing and promising action on the complaints and grievances of people who had their loved ones caught in some dire situations outside India. She not only brought back a young Indian girl who had been lost many years ago in Pakistan to India, rescued and evacuated a woman held in South Africa but also acted on the SOS tweets of many Indians caught in emergency situations in other countries. The HRD Minister, Smriti Irani was also in the news headlines when she responded to the tweet by a NIT Durgapur student and acted promptly in helping the outraged students there. 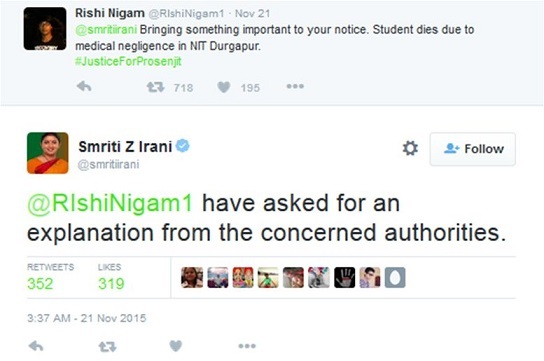 Similarly, many Indian Minsters became active on Twitter and thus, more approachable to the public. The Prime Minster (@PMOIndia), President (@RashtrapatiBhvn) along with majority other Ministers right from State Government to Central Government either came on Twitter or have become more active, if already there. Gone are the days when, in order to get your complaints and/or queries heard by our Ministers we had to go through many layers of hierarchy and follow so many rules and regulations that most times the queries didn't reach them. Now with social media platforms like Twitter, this communication gap has been bridged and the Government is in direct contact with the Public. Realizing the power of Twitter, the Prime Minister, Narendra Modi also in collaboration with Twitter launched Twitter Samvad, a platform which will allow people to receive tweets as SMSes. This will further help in bringing the Government and the people closer by getting even those communities of citizens involved who don't have access to Internet. Now each and every one of us can connect with Ministers via Twitter, share our views on the many rules being passed by the Government, bring any injustice to their notice, follow their progress and in all stay more updated and more assured of getting our grievances heard. This one is definitely an inspiring change that has motivated thousands like me comprising the normal public to go ahead, share our views with the Government and feel assured that we will be heard. 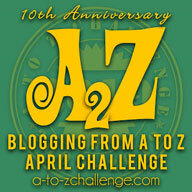 Let your voice be heard! All thanks to this 'Tweet' connection between Ministers and Common Man! What inspirational stories had you feeling good in 2015? Share your stories with me and #SpreadTheVibe!